A few years ago when I was working in Auckland’s CBD, I developed the habit of calling into the Panetone bakery each morning to get a coffee and breakfast. At the time, Panetone was making the most divine orange and date scones, and I bought one several days in a row, breaking off fragrant pieces to eat as I walked up Queen St to the office. I don’t know what made me overthink it, but one day as I was sinking my teeth into the sweet, suspiciously soft and buttery scone, I just knew that this wasn’t really a scone of the robust, humble type churned out in most home kitchens. This scone was basically cake. I was eating cake for breakfast. Call me a shallow product of gendered discourses, but I could not bring myself to purchase another one of those scones. Instead, I shifted to an alternative option offered by Panetone: bran and apple muffins. Looking back, and recalling the delectable topping of brown sugar and crisp walnuts, it’s clear that these muffins probably had at least the same amount of fat and sugar as the rejected scones. But in my optimistic mind, the presence of roughage provided the healthy edge required to render them guilt-free. It helped that these specimens were called “muffins”, which went a long way to legitimise them as breakfast food, unlike scones, which in my experience, had always been a morning tea treat topped with jam. Fast forward a few years, and much has changed. I now, on occasion, eat cake for breakfast. When I do, it is consumed gleefully. That self-conscious younger self still watches from the sidelines, but she watches breathlessly, with awe. I did not achieve this state of abandon alone – I do have a partner in crime who conspired in those first decadent moments (yes that’s right, I’m talking about you). Any resistence that remains is seriously compromised when highly respected food bloggers debate the the fuzziness of the breakfast/cake boundary, and when one of them posts a recipe for Lemon Cornmeal Breakfast Cake without even a hint of irony, it turns out that this line can be crossed rather effortlessly after all. I first made this cake in March 2011 in the final few weeks before we left NZ. It takes a special kind of delusion to pull out the cake tins when you are surrounded by half-packed boxes and feeling faint from the loss of sleep caused by crushing anxiety that you aren’t going to get everything done. But at the time, I was equally fixated on using up the supplies in what had been my Well Stocked Pantry, and this recipe enabled me to put a dent in two languishing packets of cornmeal and icing sugar. Thankfully, it also boasted the advantage of not requiring any tedious creaming of butter and sugar while still producing a lovely result. The light glaze makes the cake wonderfully moist and extra-lemony, while the cornmeal adds a pleasing textural element. It is best eaten while still warm from the oven although it will stretch out for a couple of days without too much trouble. I make this cake almost exactly as Joy specifies, although I have never cooked it in the suggested cast iron pan. A regular cake tin works just fine, and the cornmeal ensures that the cake is deliciously crisp around the edges, which is kind of what I imagine that the cast iron pan would achieve. I have experimented with the glaze that is spooned over the top, finding the quantities in the original a bit too sweet for my liking. 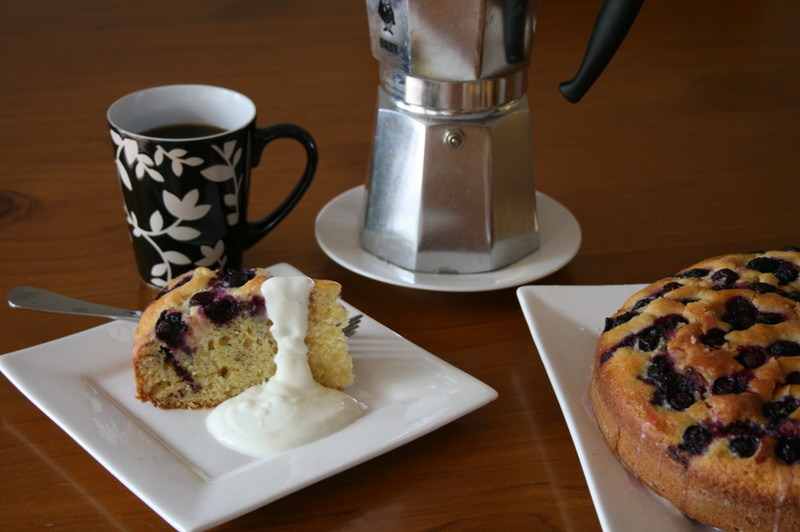 And as seen in the photo provided, I have also successfully incorporated fresh blueberries into the cake, which makes it even more breakfast-like, in case you needed a bit more convincing. Preheat the oven to 180°C/350°F. First, butter and flour a 20cm round springform cake tin and set it aside. If you don’t have buttermilk, make a quick substitute as described above, and set it aside while you prepare the rest of the cake. Brown the butter carefully in a small saucepan over a medium heat. Be careful with this, as it’s easy to take the browning one step too far and end up with burnt butter (see here for a useful guide). Once the butter is browned, pour into a small bowl and set aside to cool slightly. In a large bowl, whisk together the flour, cornmeal, sugars, baking powder, baking soda and salt. In a small bowl, whisk together the eggs, buttermilk, lemon zest and brown butter. Add the wet ingredients, all at once, to the dry ingredients and fold together with a spatula until very few lumps remain. Pour the batter into the prepared tin and dot the blueberries over the top, pressing lightly into the batter. Place the tin in the oven. While the cake bakes, whisk together 1 cup of icing sugar and 5-6 tablespoons of lemon juice to make a thin glaze, which is more like a syrup in my version. Bake the cake for 30 minutes or until a skewer comes out clean. Take the cake out of the oven and let it cool for 10 minutes. Remove the cake from the tin and use a skewer or a fork to poke numerous holes all over the top. Spoon over the glaze and let it sink into the cake. Joy advises that you should let the cake rest for about 30 minutes before serving, but I say, as soon as that glaze is on, it’s time for breakfast.